But his authentic connection with the muse, and with the electric current of rock & roll, empowered him over those years to transcend the frenzy. He knew as long as he stayed plugged into that source, and never took it for granted or tried to fake it, that he could not only maintain but prosper. Asked for the secret of his onstage joy, that infectious spark which has been igniting reverent rock and roll fires for decades, he said it was all about truth. Faking it, in rock & roll, is simply not an option. Not for Tom Petty & The Heartbreakers, anyway. That love for all aspects of his work, from the songwriting through the record-making to live performances and touring, sustained him over the decades, and never was removed from his work. Not once did he allow himself to become disengaged for long. Plugged directly into the original juice of rock and which flowed through Elvis into The Beatles, The Byrds, The Stones and the other bands that electrified his youth, Tom never abandoned that authentic passion. His music was based on that simple, visceral equation of electric guitars, bass, drums and keys united in song, always playing together in a deep pocket as only a solid unit can. Even in the studio, he knew the key to capturing the essence of rock and roll was when the band played together. Sure, he could overdub parts and add a lot afterwards. But it all started with the band playing it live, just as the Beatles always did, creating an energy that cannot be created in any other way. Even among legendary songwriters, his extraordinary instinct for writing songs which appealed to a vast swath of humanity was exceptional. His popularity expanded incrementally over the years, and by the time of “Free Fallin’” and other hits from Full Moon Fever, he crossed over all demographics to appeal to everyone from young kids to old timers in a way few rock artists have done since The Beatles. Back when music acts were divided up into those with youth appeal who went on MTV, and those on VH1 who skewed older, Tom & The Heartbreakers were on both. More than anything, he was never phony. He knew rock and roll was about real musicians playing together, and whether live or in the studio, and recognized that the energy of live performance was the fuel for his rocket ship. To the very end, his final show of his final tour, September 25, 2017 (preserved here in these photos), he remained dynamically and directly connected to the source. After having completed a “really long tour,” as he put it, that started in April of this year, he seemed happier than I’ve ever seen him. He was home again, in his element, at the historic Hollywood Bowl on the same stage where his beloved Beatles performed, and at the immense helm of a cherished band of world-class musicians. All was right with the world. Though word circulated that this could be his final tour, Tom looked so happy and sounded so strong that no one believed for a second he was ready to stop. Never did the idea occur that this was to be his last show ever. Still it doesn’t seem possible. Tom was such a force of nature, and such a positive one, that the thought of a world without him simply seems wrong. How is it possible that Bob Dylan is still alive and kicking, while Tom – his little brother in the Wilburys – is already gone? To quote Bob, it’s the sign of a world gone wrong. He made it seem easy. All of it: writing songs, making records, giving concerts. Because Tom was real, always invested completely in the art and science of authenticity, and because his songs sparkled with a charming and direct simplicity (hence their almost universal appeal), many made the false leap that it was all effortless for him. That was the exact impression he intended to make, as rock and roll, in terms of songwriting, production and live-performance, must never seem labored. It’s about spontaneous passion, not calculations contrived to deceive. There was nothing at all deceptive or false about anything Tom did; not in the musicianship of the band, the level of the songwriting, or the production of his albums. None of that could be faked. That is real magic. Unlike the illusory magic of magicians, writing and recording a classic song is no trick. It’s authentic magic, impervious to time. But although “Southern Accents” came through him, as did “Wildflowers,” those were exceptions. Still people would hear a song which seemed to spill directly from Tom’s rock and roll heart into his songbook – such as “Free Fallin,” or “You Don’t Know How It Feels” – and conclude it just arrived, with no coaxing from its creator. In fact, Tom worked hard on every aspect of his work. As he explained, it takes a whole lot of effort to make the thing appear effortless. After Tom worked on it long enough that the work doesn’t show, the whole thing zips by in about three minutes, creating the sense that he doesn’t write these songs, they simply arrive. In truth, he wrote his songs in any and every way there was. Some remained unfinished for a long time, such as “Mary Jane’s Last Dance,” for which he wrote a chorus a full year after writing the verses. Sometimes he’d finish all but one tiny part of a song. A perfect example is the classic “You Wreck Me,” which grew, as have many of his great songs, from seeds planted by Mike Campbell. Mike’s way was to give Tom a cassette tape containing many tracks of music, to which Tom would write a song. Tom was both quite crafty when it came to ingenious songwriting and construction, but also had a lot of respect, as well as patience, for this dynamic of discovery. “You Wreck Me” took almost a whole year to complete. Sensing that the title would be three syllables, he had “You Rock Me” for many months, which fit metrically, but never felt right to him. When he finally arrived at “wreck,” he knew he’d gotten there, a new instant classic that only took a year to finish. It’s powerful proof of the pure patience and endurance required to do what he did. It was on the occasion of the 1994 release of Wildflowers, his second solo album that our first interview happened. Still living in his Encino home then with his first wife Jane and his two daughters, he was brimming with joy about Wildflowers. That record, with brilliantly intimate songs like the title cut, “You Wreck Me,” and “Crawling Back To You,” reflected a songwriter at the very peak of his powers. Unlike so many greats who peaked decades earlier, here came Tom after the early triumphs, after the remarkable and joyous reinvention of Full Moon Fever, with a new album overflowing with every kind of song under the sun – from gentle acoustic ballads to pure electric rock and roll – each completely invested with the heart and soul of the songwriter. In fact, even since Full Moon Fever, with its bounty of greatness, including his most famous song ever, “Free Fallin’,” it seemed that Tom’s connection with the rock & roll muse had only intensified over the years. Hearing those songs – the playful lyrics, the beautifully infectious melodies, the warm and rich textures, the impassioned vocals, the resplendent harmonies – was hearing a songwriter in love with the art and craft of songwriting itself. That brutal judgmental part of himself seemed to have been jettisoned so that he could get out of the way to plug directly into the source in a way few songwriters have ever done with such consistent purity. Letting on that I was a fellow musician and that I was stunned by the organic, unforced and joyful nature of his new songs, all of which shone as evidence of a songwriter in love with songwriting, his eyes sparkled with happy concord that the full meaning and moment of his journey was understood, and our conversation instantly deepened. Like Lou Reed, who said that if you tell journalists of the true mystic dimensions of songwriting they will ridicule you, Tom was reticent to shine much light into the mystery with most journalists. But musicians to musicians always open up, sharing a common language, and Tom was happy from the very start to discuss this thing about which he had gained so much wisdom and expertise over the years with someone who understood what it all meant. It created a bond of trust and mutual admiration that extended over many subsequent interviews for different magazines – and one for a United Airlines inflight audio entertainment show – and ultimately led to the great honor for me to collaborate with him on a full book of conversations with him. That became Conversations with Tom Petty, published in 2005. Doing that book required me to spend more than a year of Saturdays with Tom, discussing in depth all facets of his life and career. As he kept rock & roll hours his entire life, our meetings never commenced prior to noon, soon after his wake-up time. He’d arrive sometimes sleepily, but never in a bad mood. Always ready to work, and with a happy spirit that buoyed my own, he not only made doing the book easy, he made it fun. Usually we’d meet in his home recording studio, where he used a conga drum as a table for the little bottles of cold Coca Cola we always drank. Always attired in something cozy and often whimsical – big colorful cardigan sweaters, funny knit caps, big fur-lined boots, – he always devoted ample time and thought to answering my endless questions. He loved that I would show up, as he wrote in the intro, “ridiculously prepared, to the extent of knowing how to play the songs himself.” This was true, as knowing the song from the inside out, and understanding its ingenious architecture, is the only way to truly discuss the totality of a song with its songwriter. He appreciated the singular focus on songwriting and the creative process maintained in our previous interviews, which led us to the concept of doing an entire book of conversations that would focus entirely on his songs and his songwriting, as opposed to a biography about his life. That was the original idea. But almost immediately after doing a couple conversations, it became evident to both of us that all his songs were about his life, and his entire life was built on song. And so what started as a book about art, creativity and music became a book about being an artist in the world, and all it entails. At the same time, we did focus intensely on each and every song and record he’d created up to that moment, including discards later used in his boxed set. After a session in which several songs were named about which he had little memory, he suggested that from now on we plan in advance the ten or so songs we intend to discuss. He was a pro, that way, and took everything he did seriously. For the rest of out time working on the book, he’d spend a week doing homework prior to each interview, listening to and reflecting on his past songs and records. His comprehensive answers and memories about all these records – even quite obscure ones – astounded many readers and reviewers who simply couldn’t fathom that Tom Petty – a rocker who had famously championed weed in several songs – possessed a memory so sharp as to recall every song and every record he’d ever made. He found that funny. In addition to shining light into the origins of all his songs, he also divulged the truth, as he knew it, about his personal origins. All sorts of rumors abounded about his history, including the notorious assertion that the Pettys moved to Florida because Tom’s paternal grandfather, Pulpwood Petty, killed a guy in Georgia. Had that murder never occurred, the history of American rock & roll as we know it would have been written differently. Growing up in Gainesville, Florida wasn’t easy for this tender, slender, sensitive and musical boy. His father could be wildly unhinged, a man who was forever driving his car into ditches. An insurance man who loved to fish and hunt, he had no love for Tom’s long hair, grown out then in 1965 to emulate the Beatles. But he did appreciate and even encourage Tom’s musical proclivities, buying him his first guitar, a Stella, when Tom was 12. Often when his dad would have a friend over, he’d tell Tom to come out and play a song. His father’s behavior always could surprise and even scare Tom. Most notably the time they were out fishing, and a large gator came right up to the boat. Since he was a kid, he had an uncanny knack for memorizing nursery rhymes perfectly, a skill which extended to songs as soon as he started collecting 45s. Like a musical sponge, he’d absorb every record he could get, with an early love of rockabilly. It was an education that served him well. At twelve he started playing guitar, and with only two lessons took to it naturally. Almost as soon as he could play and learn new chords, he started writing his own songs. Songwriting, like playing guitar, came instinctively to him, and he loved it. His first was called “Baby I’m Leaving,” and had four chords: C, F, G and A minor. A crafty songwriter from the start, he was especially proud of that A minor. As soon as he started writing songs he never stopped. Being in a band was all that mattered, a vision galvanized the first time he saw The Beatles on the Ed Sullivan show. From that day forward, he was a changed man. “Once we saw The Beatles,” Tom said, “we were never the same. There was nobody else with a self-contained band like them. The only bands I had seen were at the teen rec center, and they played surf music. Pop stars were not self-contained units then. I’ve never even dreamt of that. To me, I would have loved to have been a rock & roll star. But I just didn’t understand how you got to be a rock and roll star. How did you suddenly have a mohair suit and and orchestra? Their first performance was such a triumph that they repeated their set of the same four songs later in the night. Afterwards, a guy said he could get them gigs at fraternity parties if they learned new songs. Tom leapt at the chance, and playing in bands was his life and his love from that moment on. With the Sundowners gigging often, he started making more money than he did at the graveyard. Other local bands, such as The Epics, noticed him and invited him to fill in for their bassist, eventually convincing him to leave The Sundowners to join their band. He did. That band gradually morphed into the band Mudcrutch. It was then that two future Heartbreakers came into his world, both remarkable virtuoso musicians from the start, guitarist Mike Campbell and keyboardist Benmont Tench. Campbell, who Tom said was as great then as he is today, was so much greater than anyone Tom had ever heard he knew Mike had to be in his own band. Benmont, who is three years younger than Tom, was still just a kid when they first met years earlier. But he was no normal kid; he was a musical prodigy, a fact made exceedingly evident when he sat down at the organ at the local music store and played all of Sgt. Pepper. Years later Tom realized that same amazing kid was a teenager now, and enlisted him for his band. Mudcrutch became quite popular in Gainesville, playing bigger and bigger shows until the day came to follow their dream, and go to L.A. to get a record deal. So naïve was Tom about how the business worked, he came to town with a list of record companies, went to Ben Frank’s diner on the Sunset Strip, and started calling them to announce his arrival. No one told him it wasn’t done this way. Remarkably it worked, and he got offered a record deal. More than once music execs told him they liked him, but persuaded him to drop the band idea. They told him they saw him as a solo artist, and offered substantial bucks if he’d drop his band. He refused. 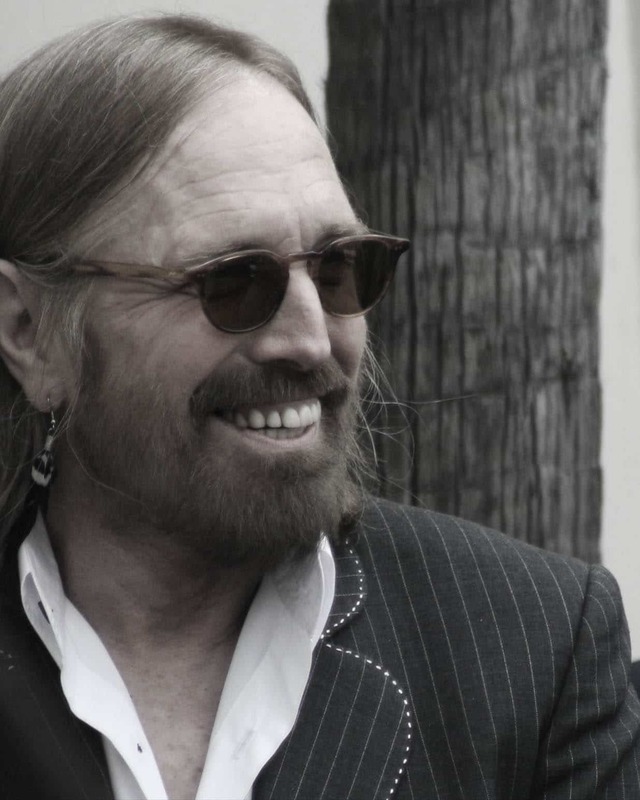 Unlike the traditional music business method of walking over your friends to get to the top, Tom Petty was always loyal, and always dedicated to his band. The first album came out in 1977. Consecutive masterpieces followed, and decades of hits and amazing songs. Forty years later, on September 25, 2017, they performed their final show at the Hollywood Bowl at the top of their game. Tom went out at the very height of his powers. Working on the book with him almost every week for more than a year, I came to feel his emotions powerfully as he related chapters of his life both happy and dark. The happy chapters came across with infectious joy, exactly like that which he projects onstage performing with the band. But Howie’s heroin addiction gradually overcame his life, and he started messing up, missing recording sessions, and not even showing up for the photo shoot for Echo. Tom loved Howie and gave him many chances to mend his ways, but to no avail, and Tom had no choice but to fire him. Tom never saw him alive again. Soon after that, Howie’s dog Dingo died, and the next day Howie overdosed and died. That said so much about Tom, about what a genuinely kind guy he was, and also such a loyal friend. It hurt him that the only portrait of Howie he painted was this dark, desolate one, which left out all the good parts. It mattered so much that he wanted to start over completely, which is exactly what we did. The second time around, which is the part used in the book, began and ended with happier memories of Howie. Looking back at that section now, the saddest part is Tom’s experience of watching Howie performing with the band on TV, and describing the surreal sorrow of seeing his friend still so alive, still in the pocket, yet knowing somehow he’s gone. It’s exactly the same way so many of us, those whose lives have been forever enriched and illuminated by his songs, feel today about Tom. It simply seems impossible that someone so vital, so fundamental to our lives, so evidently alive in every way, could truly be gone. But just as substantial as was his sorrow when relating dark chapters was the sense of joy he radiated when detailing happy ones. Except for the story of falling in love with Dana, no chapter was related with more pure joy than his time with The Wilburys. It was a time and a project unlike any other in his life, based purely on the love of songwriting, making music and being in a band. It wasn’t about commercial success or creating a hit (though they created several). It was about the joy of making music with friends. Friends who happened to be five of world’s greatest living musicians, each of whom had made a significant impact on the arc of popular song. Making the Wilburys records was pure fun. Recording the first album at Dave Stewart’s home studio in Encino, the five Wilburys would meet every morning, each with an acoustic guitar, and write a new song then and there. Everyone would toss in lines. Endearing songs of great charm quickly emerged, each of which would be recorded that very day, following a great meal prepared by their chef. It was the very rare instance of five legendary artists making music entirely for the joy of it. And that joy, like the passion projected by The Heartbreakers in every show, is genuine and infectious, and injected directly into those Wilburys tracks. If ever you feel like connecting with the ecstatic joy Tom felt making that music with those friends, it’s preserved there forever. Learning to fly, as Tom wrote, isn’t easy. Though becoming a rock star as famous as The Beatles was always his aim, adjusting to fame and becoming an icon was not something he took to naturally. Always grateful for his vast network of fans around the world who sustained his career with fervent loyalty and love for over forty years, he was nonetheless reasonably cautious about getting too close to those who become dangerously fanatical. In 1987, a woman who claimed to love him set fire to his Encino home. To save his wife, daughters and housekeeper, he had them all immediately leap into the swimming pool. That came only seven years after Lennon was shot dead by a fan. But it was the attack on George Harrison’s life that darkly haunted him forever. He never got past it. He and George were more than friends, Tom always said. They were brothers. And George of all people was, as the world knows, one of the most spiritual, peaceful and beautifully centered souls around. So for him to be attacked in his own home, as he was on December 30, 1999, was a brutality far too horrific for Tom to digest, and forever darkened his outlook. Still at times there was a sense that Tom felt somewhat trapped by his celebrity. He described fame to me once as being similar to “going to a party with your psychiatrist.” By which he meant that everyone would scrutinize his every move, his every word, and rarely just let him be. When Tom first met those who had been the early idols of his own existence – such as Harrison and Dylan – he learned to dampen his own tendency to deify them. It’s the reason he’s not only a beloved artist but also, like George, a famous friend. Those who loved him knew a warmth and loyalty that was the essence of the man. He was, above all, real. And for that reason, even those that became rock gods before him became best pals with Tom Petty. This included even the guy Tom considered the cagiest and most mysterious of all. Bob Dylan. George Harrison and Dylan had become good friends and co-writers years earlier, and both warmly welcomed Tom into their fold. Tom said he realized, both from getting to know Dylan and also reading his book Chronicles, (which Tom loved, and said was like a great epic poem) that even Bob was human, and like him, needed people in his life who knew that. Dana’s love, both for the man and his music, went a long way in giving Tom that peace for which he yearned. When they first started spending time, he let her know that he never listened to his own music. She told him that was a problem because she loved those records and played them a lot. He said, “That’s fine. Just don’t play them anytime I’m around.” He tried to explain that it was impossible for him to hear them without painful analysis of every aspect, especially all the imperfections. Sure, “pretty good” is a serious understatement for what he did. But it speaks to her profound impact on his life and spirit. Not only did she give him a more expansively generous estimation of his own work, she kept reminding him everyday, in gentle ways, of the true magnitude of the blessings in his life. Her daily impact on him, forever brightening his spirit anytime she was near, was touching to witness up close. While working on the book, she frequently appeared with a warm smile and maybe some smoothies – or delicious home-made chili she’d just cooked up – and his aspect would be instantly eased, and that sparkle would return to his eyes. It was true love. A world without Tom Petty in it. It’s not something that we, his fans forever, are prepared for in any way. But the music remains. He left us behind a bounty of songs and records so timeless, true and inspirational that they will enrich our lives forever. He gave us way more than anyone has any right to expect. Had he written only one song at the level of “Free Fallin” or “Insider” or “Southern Accents,” he’d be an artist we’d revere forever. But he did so much more. He devoted nearly forty solid years to writing and recording the purest, truest rock & roll he could coax out of his soul. And not once did he let us down. Few gifts ever made him happier. He loved the way a song could suddenly come alive after never existing. And though it was something he rarely expressed, it also gave him solace and some measure of joy to know that his music would live on beyond him.